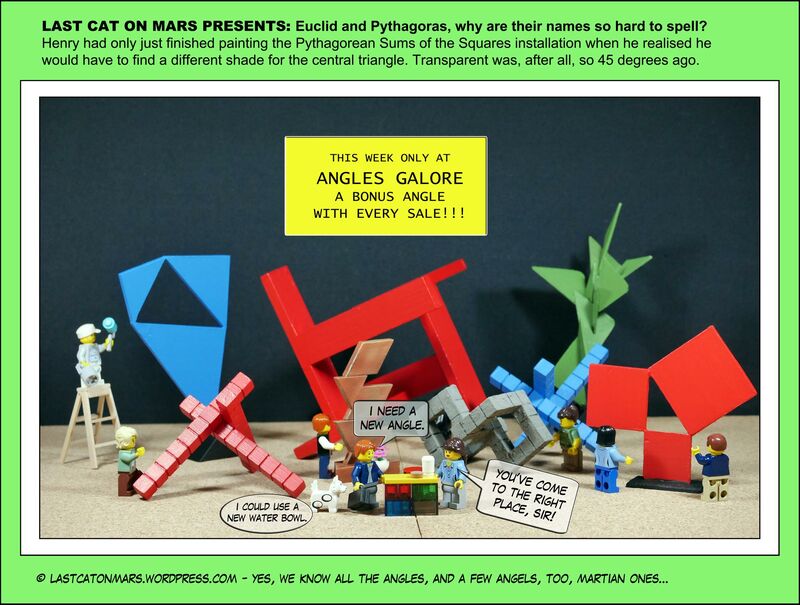 Last Cat On Mars Presents: Euclid and Pythagoras – Why Are Their Names So Hard To Spell? You only live once, friends, and you really should experience as many angles as possible in this big old angley world. My favourite is the one where I find myself slumbering peacefully at very close quarters to the nearest overflowing tuna-and-other-pescatarian-delicacies bowl at the all-you-can-eat sushi bar. Obsessive much? Hell, no, not moi. This entry was posted in Sculptures and tagged angles, cartoons, comics, contemporary sculpture, geometry, installations, lego, maquettes, minifigures, Sculptures on May 30, 2018 by Jay Verney. Here on Mars, it can be difficult to find a comfortable chair, or even a packet of chips to eat while sitting in the comfortable chair that’s hard to find. There’s little else to do as we wait for the potato crop to come in (though it may not since we haven’t bothered to plant it yet, too busy sitting in the non-existent chair). Things are going off the rails here, so I’m off to see my good friend, the Mobile Psycatrist (watch out for her in future instalments from the fourth rock). 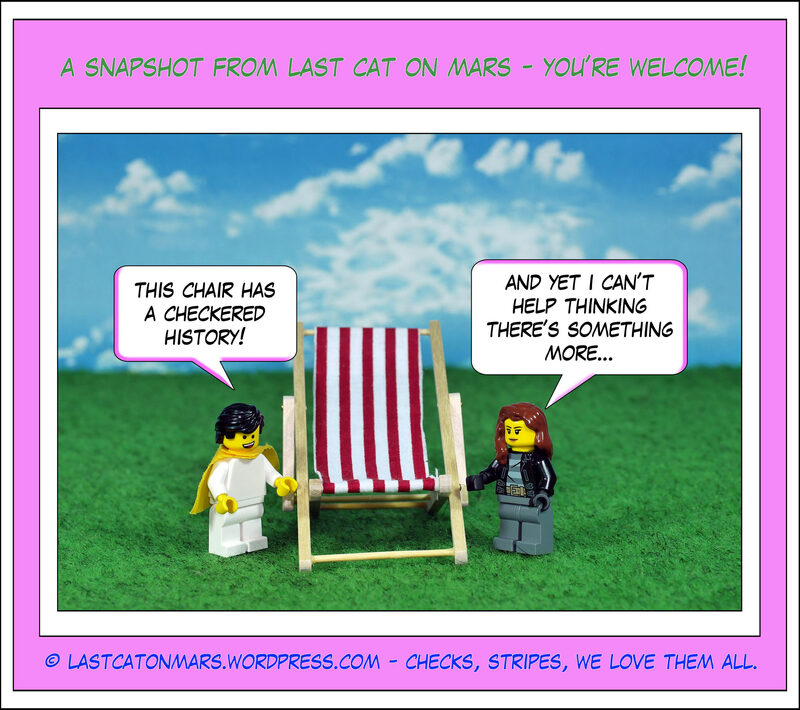 This entry was posted in Snapshots, Variety Show and tagged cartoon, comic, deck chair, lego, minifigures on May 16, 2018 by Jay Verney. My only advice is this: don’t invest in standing stones, there’s no future in them, but a hell of a past, that’s for sure. Also, ensure that you contribute to your Super fund however you can. As you age, and even those of us with nine lives, or more, do age, eventually, you will appreciate the windfall that’s coming your way as you slide into decrepitude like most of the standing stones. In addition, standing stones are fun to read about as they embody the mysteries of human (crazy species) attempts to understand the mysterious, the thin places where dimension collides with dimension. Of course, here on Mars, there are lots of thin places due to the very light gravity compared with Earth (about 38% of the third rock’s). So, if you want to lose weight all of a sudden, come and visit with us anytime (anytime you can hail a passing rocket, that is, ahahahahahah). 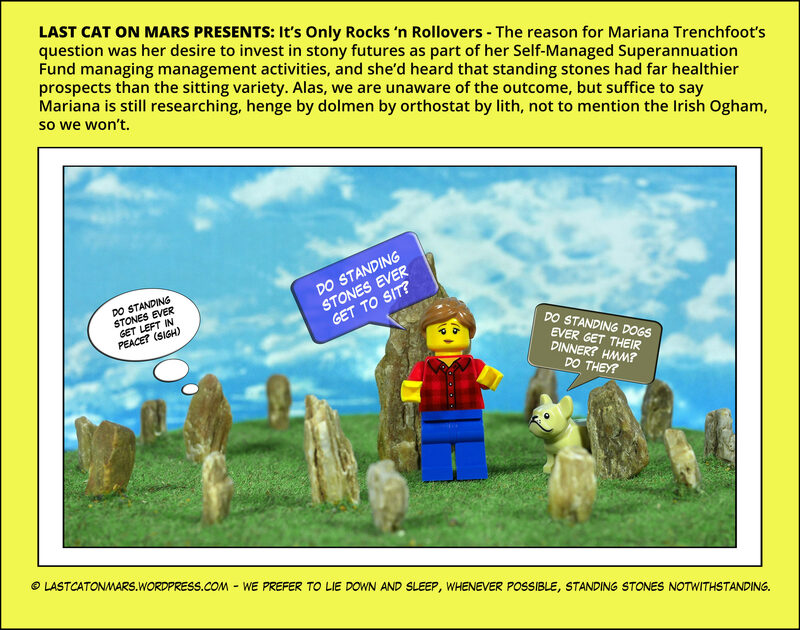 This entry was posted in History, Variety Show and tagged cartoon, comic, dog, lego, minifigure, standing stones, superannuation on May 2, 2018 by Jay Verney.